The seventh annual Together! 2018 Disability Film Festival takes place from 7-9 December at the Old Town Hall Stratford, screening films by Deaf/Disabled filmmakers and films with a strong central Deaf/Disabled character. 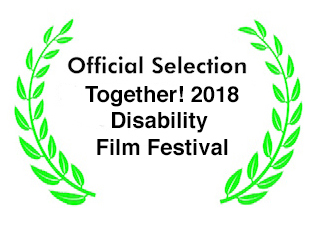 We have strong relationships with other Disability Film Festivals, and are screening films in partnership with Oskar Bright in the UK and SuperFest in the US, as well as working with organisation who develop Disabled filmmakers such as Film Oxford, Biggerhouse and 104 Films. We are the only UK Disability film festival to include Deaf and Disabled people from all impairment groups, including Disabled people with physical and sensory conditions, learning difficulties, mental health difficulties and long-term health conditions. The Festival is FREE – we even serve you free drinks and snacks – and open to all. We include films made on every budget and by filmmakers of all ages. Our priority is to provide a platform for strong storytelling, highlighting the lived experiences of Deaf/Disabled people from diverse backgrounds, and the talents of community, emerging and mid-career Deaf/Disabled filmmakers. Many of our films are world or international premieres, and go on to festivals worldwide. We welcome filmmakers to join us at the festival, and do all we can to facilitate networking. We create a fully accessible pop-up cinema in Newham’s glorious Victorian venue the Old Town Hall Stratford, with seating including cushions and bean bags for those who find it more comfortable, and our custom-made ‘VibraBenches’ for those who like to feel the sound. Most films are captioned, and we provide live audio-description on demand. Films containing BSL are scheduled together in each screening programme, and we provide BSL interpretation for our Saturday lunchtime discussion. There is limited Blue Badge parking at the venue, and Stratford station is on the accessible Jubilee & DLR lines. If you can’t join us in person, you can join us virtually. At the start of the Festival, we re-release the programme with the addition of links to available online versions, trailers and download sites, and these remain online in our archive as a portal to Disability Film for programmers and scholars. You can find further details of previous years’ programmes via the Archive section of this website. For the first time this year we will be implementing the ‘F’ rating system when we publish our final programme – one ‘F’ each for a Female (self-defined) writer, director central character(s) or focus. We are also introducing the ‘D’ rating system – one D each for a Deaf/Disabled (self-defined) writer, director, central character(s) or focus. We look forward to Film Festivals worldwide taking this system up with the same enthusiasm that they have greeted the ‘F’ system, and will be writing to all of the F-system participants following our festival. Old Town Hall, 29 The Broadway, Stratford, London E15 4BQ. 020 3373 7033 /07791 291 685. Nearest tube, overground and DLR stations: Stratford (fully accessible). Bus routes include 25, 69, 86, D8, 104, 108, 158, 238, 241, 257, 262, 276, 308, 425, 473, N8, N86, 010, A9, 741 & UL1. Blue Badge holders can prebook parking; others are advised to use the (old) Stratford shopping centre carpark and cross straight through the centre (the Old Town Hall is opposite the far entrance). Click here for further details and images. 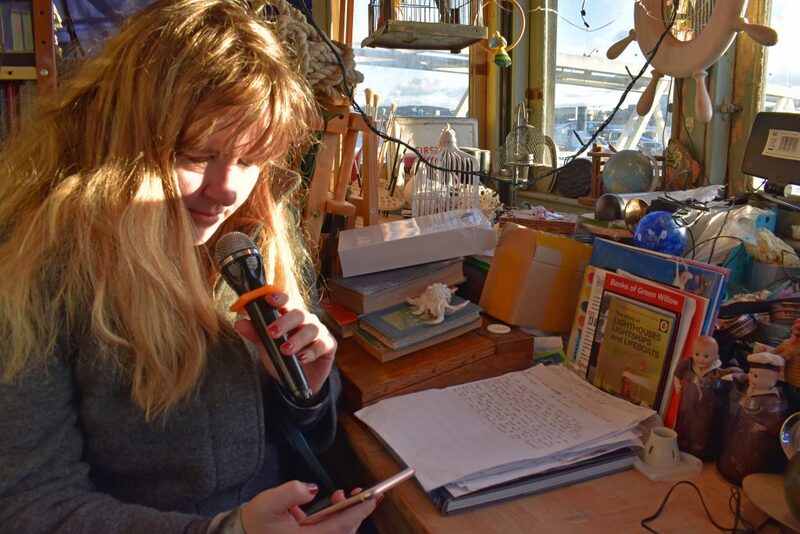 Experimenting with tactile sound at Trinity Buoy Wharf at the 2017 workshop for emerging Disabled filmmakers led by Julie Newman.